Last night I wrote that I had several things on my mind, but I only wrote about my frustrations with restaurants - Swiss Chalet in particular! I was just too tired to finish my rant. I'm wide awake now and ready to write! A few months ago I wrote about the Ontario Disabilities Act (AODA), especially in relation to how a lot of buildings just aren't accessible, even though they should be. For example, it has infuriated me for the longest time that the Holiday Inn by my place renovated a few years ago and instead of putting a ramp in one of its two front entrances it simply put up railings on the stairs. Grrrrrrrrrrr! Bastards! So I'm so happy Starbucks moved into the hotel, and guess what - a ramp is being built in one of the entrance ways! I'm sure a lot of my friends would say Starbucks is an evil corporation, and sure maybe that's true. I don't know. 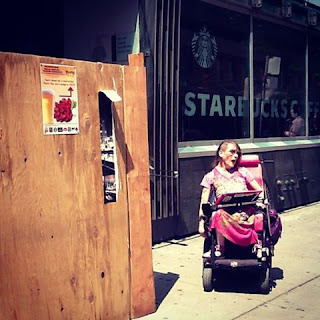 But from what I've seen Starbucks has good disability politics. Well, at least they make their cafes accessible anyway. And speaking of disability politics the cops could sure use a lesson or two...maybe 100!! My friend went to see fireworks on Canada Day. She is like me, non-verbal and in a wheelchair. Apparently is was very crowded and somebody accused her of bumping into them. She swears that she didn't do this and I believe her. The person who said she had bumped into them called the cops, and the cops called Wheeltrans and made my friend go home. This is disgusting to me and makes my blood boil! I've been in crowds so many times, and people are constantly bumping into each other and stepping on each others feet. Sometimes people even trip and fall, but are cops ever called? No! People just carry on. I've had people fall into my lap too, because they've been jostled by the crowd. Nobody is ever sent home because they accidentally bump into another person. My friend felt so angry and humiliated. All she wanted to do was watch the fireworks and she was sent home like a naughty child. People should be more empathetic and less hot headed. And cops should treat people with disabilities like anyone else, I'm sure they wouldn't send anybody else home for accidentally bumping into someone.